What Happens When You Take Two Weeks Off From Blogging? What Happens When You Take Two Weeks Off From Blogging? What Happens When You Take Two Weeks Off From Blogging? It (fortunately) hasn’t gone unnoticed that there have been no published blog posts to the Tomato in over two weeks. Have you ever wondered what the effects of not writing for two weeks on a regularly updated blog will have? We can’t speak for you, but this is what has happened to us. The very thoughtful concern for my well-being has been the most notable reaction to the absence of blogging here on Tomato. Thanks to all of you whom expressed your sincere concern. It is comforting to know that the friends I have made through blogging are just that, friends. The daily traffic that is generated by the Tomato has taken a significant hit. What was regularly 330-350 daily unique visitors is now hovering around 185. That’s a drop of nearly half. At a quick glance, it appears that the traffic source that is holding strong is the Search Engines. Google, which accounted for about 35% of daily traffic is now closer to 45%. Not rocket science here, but it could be deduced that half that daily traffic was coming to read the articles we had published and syndicated. Naturally, with the traffic slump comes the blog directory ranking slump as well. What was normally a 25-28 placement ranking in BlogTopSites is now 41. Being competitive, that one especially stings. Comments, after publishing an article range from 10–20 per article and 4–5 per day in between writing days. During the last 2 weeks we have received 23 comments total. This is encouraging, but, it is also safe to assume that this rate would continue to suffer the longer we delayed posting new content for our regular readers (whom leave most of the comments). As much as this article may look to be a reflection in experiment, it is meant as a lesson to those slumping in their own efforts on their blogs to recognize that time off is a bad blogging habit. How quickly the blogging void was replaced by other efforts is staggering. This is the challenge with balancing success and marketing. When marketing works well, it seems that it is the first thing to be sacrificed, if it takes any effort. My wife, who has been in the television sales industry for 7 years, suffers a similar fate once her clients achieve grand success with their commercials; once the business surged, the marketing budget and effort often dries up. Now this is never wise, however convenient. It is the marketing that had brought the success and should be seen as the source of continued success. Pulling back on the effort that garnered the fruits will only leave you in yearning when the dust settles. The further I got from writing, the less the desire came to me. What used to be a regular offering, became a guilty inaction and finally a forgotten commitment. The irony lies in the fact that I have over a dozen articles this close (hold index finger and thumb just a millimeter apart) to being polished for posting. Fortunately, two weeks hasn’t been enough to slow the request for service from the Tomato Team. It seems the bank of content (250+ articles) is still hard at work while the distracted had moved on. But, I can imagine, it would have been only a matter of time before the inactivity stated to take its toll. Curiously today we are at one of our highest recorded reader rates of 1261, but the significant note is that we have note really grown in the last couple of weeks. Since January we had been experiencing leaps as much as to 75-100 readers weekly. Two weeks ago today we were at 1235. Our business model is built on service and education. As we grow, the commitment to both has its effects. For the last two weeks that effect has been on our availability to participate on the Tomato creatively. Our offerings are generally very intense. “Mailing it in” is not an option. Yet, nonetheless, neglecting the audience that has built our business, reputation and success is out of the question. So, as much as this article may look to be a reflection in experiment, it is meant as a lesson to those slumping in their own efforts on their blogs to recognize that time off is a bad blogging habit. Imagine your regularly updated real estate blogsite to be something of a regularly received publication like your local newspaper. What effect on readership would a 2 or 3 week hiatus have? The hard quantifiable data from your two week absence is indeed a lession for us all. Nothing like a good shot of realty to sober one up. Nice to have you back. Hey, look at that, you weren’t squashed on the highway. Well, that’s good news. Mom tomato and papa tomato are walking across a highway. Baby tomato was lagging long at his own pace, and got hit by a truck. Papa tomato looked back and said: Catch up. Nice article. I had similar problem with my blog. I was for three weeks without writting anything and I lose many visitors. Hopefuly now I’m recovering them. However, could you explain what should it be done to recover readers? could you give some advices? The milk carton was worth the wait. . .damn funny, sunshine. I’ll click back 7 or 8 times if it will help the stat’s. . .feel the love? I took a three week vacation on The Real Estate Guide and even had guest bloggers sit in for me for 70% of my away time. Four months later I about broke even with readership. I set up my blogs to drip, so nobody knows if I’m around or not. 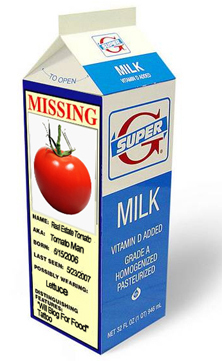 I’m always at least a week or so ahead of myself in blogging, just in case I get hit by a car or a milk carton with a missing tomato on it. Glad you’re safe and sound. As a wantabe blogger I have been watching you closely, educating myself, and anxiously getting ready to start blogging. I was at once, concerned that the latest temperature (or maybe market) drops had frozen the fruit and set back that my blog idol was not going to be there to inspire me anymore. OK now I can take a deep breath and go for it. Welcome back. I had a reader once e-mail me about about my lack of blogging. It’s funny how they don’t comment regularly (or ever) but you know that you are getting read nonetheless. You didn’t blog for two weeks? I guess I missed it. 🙂 On my blog there are certain posts I have to write or people start asking questions. I don’t like questions. 🙂 Much of my content is written ahead of time. I took a week off and no one noticed because there was a post every day. I am a bit guilty myself these last two weeks. Dedicated time to focus on good quality posts seems to be the key. Thanks for your continued guidance and insight. I have definitely experienced this myself. I guess it’s like exercise – gotta do it consistently or risk falling off your routine.